Enclosed in our homemade crust you will find beef, potatoes, onions, carrots and rutabaga. Enclosed in our homemade crust you will find chicken, potatoes, onions, carrots, and rutabaga. Enclosed in our homemade crust you will find broccoli, cauliflower, potatoes, carrots and onions, with just a hint of cream cheese and cheddar cheese. We serve Apple Pasties and an addition Flavor of the Day, typically Cherry or Blueberry. Seasonally we will serve Pumpkin Pie Pasties with Whipped Cream. Condiments typically used include ketchup, beef gravy, and chicken gravy. How to re-heat your homemade frozen Muldoons Pasty. Allow Pasty to thaw. Preheat oven to 350 degrees. Remove pasty from package; place on cookie sheet. Reheat for 25 - 30 minutes. No need to cover, unless you feel it is too brown. If you choose to microwave, Microwave: 5 - 6 minutes; thawed 2 - 3 minutes. 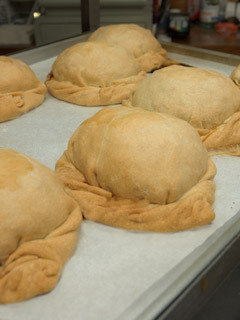 Reduce heating time for our Vegetable Pasties.